If every biker wore reflective clothing, it would make driving easier, but ensuring safety on the road is a mutual process for drivers, bicycle riders, and pedestrians. Command drivers to slow down with Watch for Bikers Speed Limit Signs. Their fluorescent qualities guarantee nighttime and distance visibility. 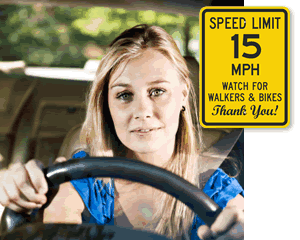 • Watch for Bikers and Bicycle Signs protect pedestrians. We also remind drivers to share the road with bikers. • Our signs are composed of tough aluminum, which will endure through harsh outdoor weather. • These chemical resistant signs will last for up to ten years. They are unyielding support tools for road safely. • Consult with our Live Help listed above if you have any questions.